Conventional WRB-AB membrane systems can be time and labor intensive. 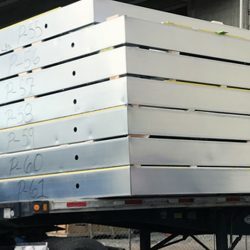 With the industry’s labor shortage top of mind, Georgia-Pacific Gypsum engineers and chemists went to the drawing board to develop a new all all-in-one water-resistive barrier air barrier that eliminates the need for a separate building wrap, fluid-applied, or peel-n-stick system. The DensElement® Barrier System with AquaKor™ Technology is the result. 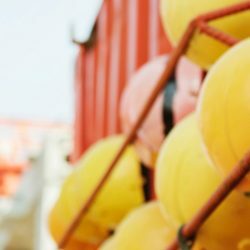 Georgia-Pacific pioneered a chemistry and manufacturing process that created a disruptive innovation that is transforming the building envelope. DensElement® Barrier System is the result of the innovative science called AquaKOR™ Technology. AquaKOR™ Technology features a proprietary formulation that transforms the entire gypsum sheathing by integrating the gypsum core and the fiberglass mat in the factory under controlled conditions to form a hydrophobic, monolithic surface that blocks bulk water, but allows vapor to pass through. Due to the AquaKOR™ Technology filling voids in the glass mat, bulk water is blocked at the board’s surface. This advancement frees the industry from traditional methods of manually applying a WRB-AB over the sheathing on the job site where misapplication can occur. This proprietary expertise was designed to help keep walls dry to avoid building envelope failure. 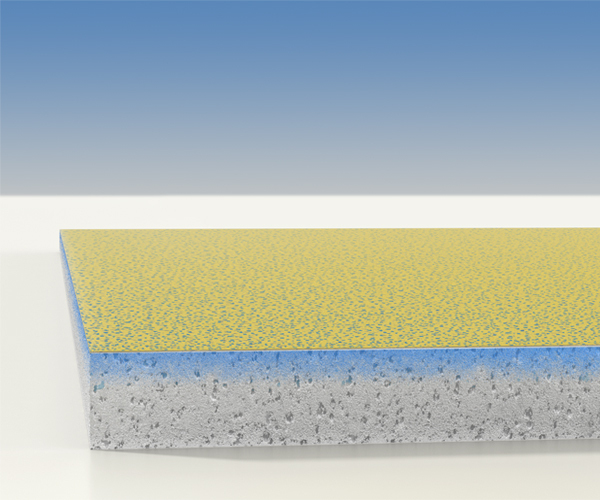 By having high permeability, DensElement® Barrier System enables moisture vapor to pass through the wall in both directions. This allows wall assemblies to dry out should they get wet, helping to avoid mildew, mold and deterioration. Patented DensElement® Barrier System is finished easily by properly sealing joints, fasteners, openings, and transitions with PROSOCO R-Guard® FastFlash®. Engineering the WRB within the sheathing’s core and mat also guarantees continuity of application. As such, the mil thickness of fluid-applied membranes is no longer a consideration factor for installation error. DensElement® Barrier System’s perm rating is always greater than 20 which could allow for more efficient drying of the wall cavity. AquaKOR™ Technology fuses the mat and the core into one monolithic WRB which, when used with PROSOCO R-Guard® FastFlash® Liquid Flashing, creates a continuous air and water resistive barrier. The end result is a faster, easier installation process that provides the protection of a continuous WRB-AB. The advantages speak for themselves. Compared to traditional WRB-AB methods, DensElement® Barrier System saves installation time and can increase your bottom-line savings due to its simplified installation. In a time-motion study conducted by Home Innovation Research labs, DensElement® Barrier System was compared against some typical WRB-AB systems in a sample three story building. DensElement® Barrier System was installed about 25% faster than the building wrap and about 40% faster than the typical fluid-applied WRB-AB system in the study. 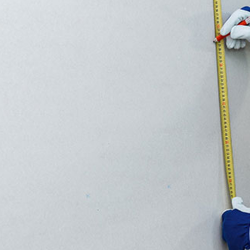 Because the weather resistive barrier is integrated into the gypsum core and fiberglass mat, the number of steps required to meet performance requirements of your exterior wall system is significantly reduced. Not only does this new WRB-AB that’s integrated within the system reduce installation time, but safety risks are also reduced with less time spent on the job site. The fused system eliminates an installation step allowing you to move on to the next job faster. Unmatched by traditional systems that require an external water-resistive and air barrier, this advancement enhances the performance of the gypsum core and creates a consistent WRB-AB within the board itself. With no additional WRB-AB needed, the DensElement® Barrier System with AquaKOR™ Technology offers the ideal blend of optimal performance and simplified, time-saving installation. DensElement® Barrier System supports nearly any cladding type, allowing you to design the façade of your choice with confidence. It works under brick, metal panels, rain screen, inverted walls, EIFS, stone, and fiber cement siding. And since the DensElement® Barrier System is non-combustible, it does not need to be included in NFPA 285 assembly testing to comply with 2018 International Building Code requirements. Simplified installation, optimal protection against bulk water infiltration, and the versatility to work with a wide range of cladding options makes DensElement® Barrier System with AquaKOR™ Technology a clear choice for protecting your design. 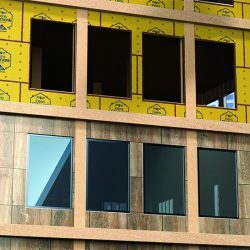 Through its integration of two formerly separate trade responsibilities – the application of the sheathing and WRB-AB – DensElement® Barrier System also eliminates the “by others” compatibility issues of multiple trades on the moisture control layer and transitions to other materials. The system meets all applicable ASTM standards, including fastener seal ability. In fact, when RDH Building Sciences in Waterloo, Ontario, was commissioned to conduct water penetration testing using ASTM E331 methodology that stressed the DensElement® Barrier System at the cladding fastener penetrations, its performance was comparable to that of thin- and thick-mil fluid-applied membranes over fiberglass-mat gypsum sheathing. And the high vapor permeability of DensElement® Barrier System provides excellent drying capability. Ultimately, DensElement® Barrier System provides a high-performance integrated WRB-AB solution that preserves the integrity of the building design from inception to completion. DensElement® Barrier System with AquaKOR™ Technology helps save money by reducing installation time, saves labor and materials, and lowers bottom-line cost of projects. The results presented reflect the findings on specific construction assemblies. under test conditions. Actual results may vary depending on the system, the building, the installation methods, and other factors.